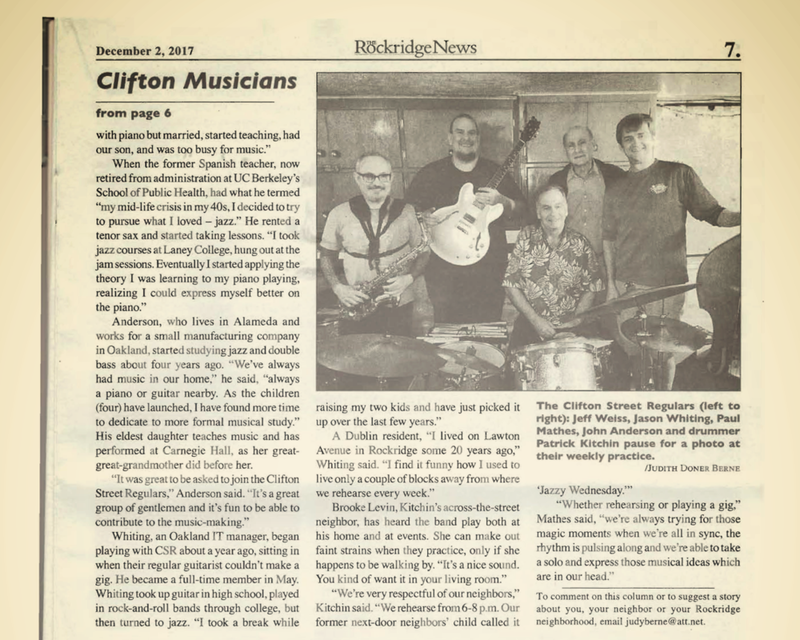 The Clifton Street Regulars are a jazz quintet that has been playing jazz around the San Francisco Bay Area since 2013. Exploring swing, blues, latin and bop, the Clifton Street Regulars play a variety of songs from the jazz standards catalog. Sign up with your email address to receive information about upcoming gigs. We respect your privacy, and won't share your email address. The Clifton Street Regulars are playing at Caffe Chiave in Berkeley. Downbeat is at 7pm and we'll be playing a variety of jazz standards. 2500 San Pablo Ave. The Clifton Street Regulars are playing at Caffe Chiave in Berkeley. Downbeat is at 8pm and we'll be playing a variety of jazz standards. 2500 San Pablo Ave. The Clifton Street Regulars are playing at Caffe Chiave in Oakland. Downbeat is at 7pm and we'll be playing a variety of jazz standards. 4045 Piedmont Ave.